One hundred years ago Maine moved majestically into a period of unprecedented prominence and prosperity. 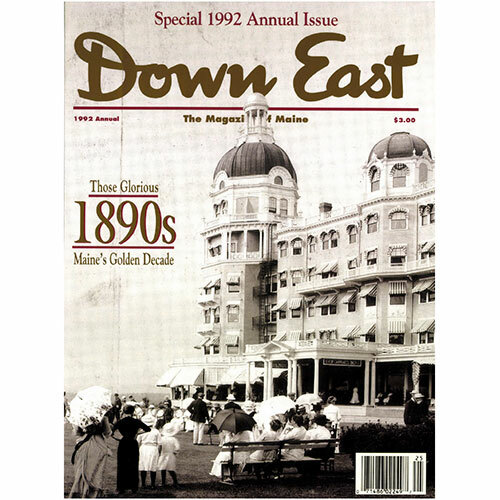 This 1992 Annual issue of Down East examines some of the people, places, and events that characterized the giddy and gilded decade. Special issue editor: Ellen MacDonald Ward. In the final decade of the last century, the State of Maine had risen to a position of power and eminence never equaled before — or since. By Wayne Curtis. Genteel guests flocked to the Poland Spring House a hundred years ago to try the miraculous mineral water — and a new sport called golf. By Jeff Clark. The lady was a poet on Appledore Island and the painter was Childe Hassam. Together they crafted an ode to an era. By William David Barry. From Presidential aspirants to prolific inventors, strong personalities lit up Maine’s Golden Decade. By Ellen MacDonald Ward. For a young heiress from Albany, the summer of ’92 was a time of discovery, and the uninhibited world of Bar Harbor was the place to be. By Nan Lincoln. Overnight a sharp tycoon turned the sleepy hamlet of Rumford into a brawling industrial center. By Jason Stone. Custom and time alike had prescribed a washtub by the kitchen stove; and time and custom in the nineties were not lightly set aside. By Mary Ellen Chase. Cover: The fabled Poland Spring House became so popular with well-heeled vacationers in the nineties that it was continually enlarged and remodeled to accommodate the growing clientele. This computer-enhanced photograph shows the grand hotel at the height of its popularity, after yet another expansive renovation in 1903. Photograph courtesy of Maine Historic Preservation Commission.